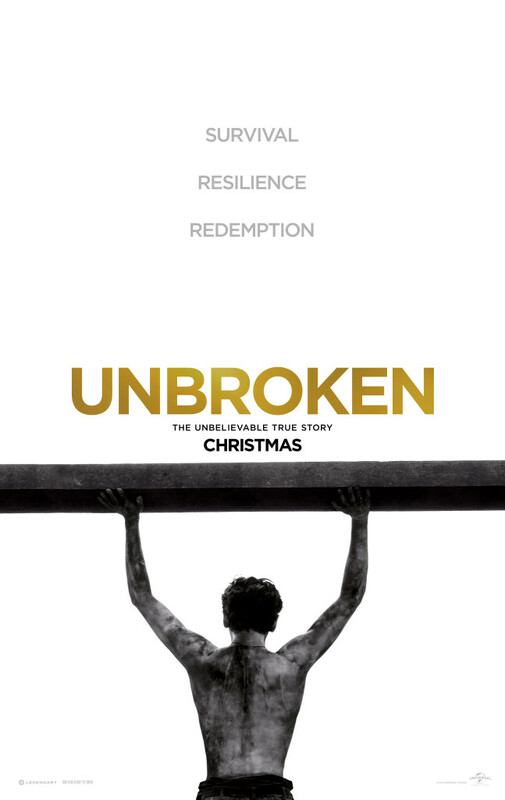 As far as life stories go, the one at the heart of Angelina Jolie’s second directorial effort, Unbroken, that of Olympian distance runner and World War II POW survivor Louis “Zam” Zamperini, is certainly one that’s extraordinary, and more than worthy of being brought to life on the big screen. Already the subject of a New York Times runaway bestseller by Laura Hillenbrand (Seabiscuit: An American Legend), Zamperini’s was a life characterized by incredible determination and fortitude, one that by all rights should inspire anyone beset with the most adverse of life circumstances to believe that triumph and redemption are always possible, however remote and unobtainable they may seem. Unfortunately, the film adaptation of that story brought to audiences by Jolie and screenwriters Joel and Ethan Coen (No Country For Old Men, Inside Llewyn Davis), while certainly well-intentioned, falls short of the mark in terms of taking this story to the inspirational heights that it should reach. It has moments of captivating drama and visuals, but for too much of the film gets bogged down in its drawn-out depictions of the various torments Louis suffered for years in Japanese internment camps prior to the end of the war. The Coens’ script starts audiences off with Zamperini already serving as a bombardier aboard a B-24 bomber flying missions in the Pacific theater against Japanese targets at the height of the war in the Pacific. The film then utilizes flashbacks during moments of crisis to show Louis’s beginnings as an oft-in-trouble child of Italian immigrants in Torrence, California, his introduction to track and running by his elder brother Peter, his subsequent development into an Olympic class runner, and his record-setting performance at the 1936 Summer Olympics in Munich. All those recollections, characterized by Louis’s overcoming of adversity and refusing to quit, prime audiences for the first of his most difficult experiences, the crash of his plane in the Pacific while on a search and rescue mission in May, 1943. Adrift in lifeboats, Louis, along with the two other surviving members of the eleven-man flight crew, pilot Russell Allen “Phil” Phillips (Domhnall Gleeson) and tailgunner Francis “Mac” McNamara (Finn Wittrock), battle hunger and thirst, fend off sharks leaping into their rafts and barely escape a Japanese bomber strafing them as they struggle to survive and await rescue. When that “rescue” comes, it’s in the form of the Japanese Navy, who find the survivors after 47 days at sea. For the next two years until the end of the war in April, 1945, Louis lives through one harrowing prisoner of war camp after the next, each with its own unique torments and trials, but none worse than those suffered at the hands of Mutsuhiro Watanabe, nicknamed “The Bird” (Miyavi), a brutal warden whose acts of torture upon Allied prisoners earned him a place on the United States’ postwar list of most wanted war criminals. What’s most puzzling about Unbroken and why it never quite reaches the heights that it should given its source material is Jolie’s choices of which moments to dramatize and incorporate into the film. Admittedly, selecting the “right” moments from a life so chock full of amazing inspirational moments might prove daunting for any director, but Jolie seemingly chose to stick to the more easily-filmed moments. The plane crashes, the battles for survival while adrift at sea, the brutal mental and psychological beatings that were a part of life as a POW, the scenes that lend themselves more to spectacle are what fill the screen and Unbroken‘s considerable running time, and after a while it all feels like Jolie approached the whole task of bringing this story to the screen with the intent of making the story of Louis Zamperini the most inspirational that any member of the audience has EVER seen in their entire lives. You can feel her expecting and demanding your admiration of Zamperini growing especially in the film’s final act, with each depiction of torture and humiliation, each act of cruelty that Louie endures and battles his way through, until it’s almost as though the production is shouting at you, “You will be inspired or else!” Taken into consideration with the fact that Zamperini’s postwar struggles with PTSD and his devotion of the remainder of his life to his faith are elements of his story that are just as soul-stirring as the moments Jolie chooses to dramatize, and those moments are simply glossed over with text at the conclusion of the film, it’s hard not to imagine what this film might have been like had it been handed to a more experienced director with a different vision of how to make it all work in mind. In terms of performances, the actors do well with what the Coens’ lean and efficient script provides for them. British actor Jack O’Connell brings great charisma and convincing physicality to the role of Louie, while Japanese rock star Miyavi, in his film debut, brings to life “The Bird” in a way that thankfully transcends the stock villainy of POW camp tormentors audiences once endured in celluloid in the 70s and 80s. Their work and the fine work of the supporting cast might lead one to suspect that while she needs to develop her sense for pacing and which story beats are most critical for effective storytelling, Jolie’s strength as a director may lie in her ability to cast and to bring out great performances from her actors. There isn’t a single performance here that detracts at all from the film’s quality, and there are a few that should lead to greater opportunities in starring vehicles in Hollywood in the future. Thus, taken in total, Unbroken is not wholly a disappointment. On the contrary, there’s a lot to appreciate here, not the least of which is Jolie’s clear commitment and belief in the power of Zamperini’s story, which is evident in every frame. Given the chance, it may well push all the right buttons with Christmas Day moviegoers seeking out this kind of story and movie experience as an escape from all the materialism and lack of perspective that characterizes how Americans tend to celebrate the Christmas holiday. Starring Jack O’Connell, Domhnall Gleeson, Miyavi, Garrett Hedlund, Finn Wittrock. Directed by Angelina Jolie. Rated PG-13 for war violence including intense sequences of brutality, and for brief language.